Today, (24th March 2014) Compassion handed in the signatures of an incredible 475,576 concerned EU citizens who are calling on EU Agriculture Ministers to ensure laws are enforced to protect pigs. An artwork containing the first name of each person who signed the Pig Petition was presented to decision makers across Europe. Click to enlarge. The signatures were presented to a broad range of European decision makers including; Danish Agriculture Minister Dan Jørgensen, his Slovakian counterpart LĽubomír Jahnátek, a representative from the German government Dr. Karin Metz, a representative from the UK's Department for Environment, Food and Rural affairs (DEFRA) and the Greek Minister for Agriculture Athanasios Tsaftaris representing the presidency of the EU. Throughout March, 'Hope' - our giant inflatable pig - toured Europe, visiting: London, Paris, Rotterdam, Berlin, Warsaw, Prague and Brussels, to bring attention to the plight of pigs in countries where they are suffering in illegal and inhumane conditions. The EU Pigs Directive requires that pigs be given enrichment materials such as straw. It also bans routine cutting of tails, which is scientifically proven to be unnecessary if the pigs are kept in good welfare conditions, as they are then not driven to bite the tails of other pigs. Compassion's recent undercover investigations have revealed some of the worst cases of animal cruelty we've ever seen. Our investigations exposed pigs with their tails illegally docked, living in overcrowded, barren pens; animals covered in their own filth; pigs with abscesses and some even missing eyes. Over 475,000 EU citizens are standing up for pigs. The people want laws enforced and pigs protected. The question now is - how can the EU Commission continue to ignore this call for action and integrity. The Pigs Directive has stipulated the requirements. All we are asking for is for the law to be enforced. 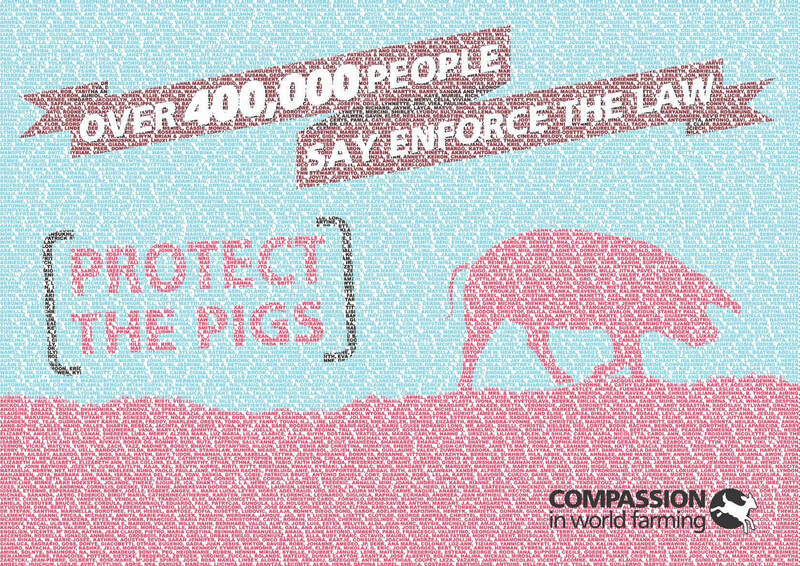 Tell the Commission to enforce the law and protect the pigs. Hope inspires children in Rotterdam, Netherlands, to protect the EU's pigs. 70,000 German citizens are asking for an end to illegal conditions for Europe's pigs. Hope draws a crowd at Place de République, Paris. Hope captures the attention of the French media in Paris.